Several cities in Florida have become some of the fastest growing regions in the United States in recent years, and with this strong growth comes strong demand for new infrastructure. The I-4 Ultimate project is a highway expansion development of more than 21 miles throughout the Orlando metro area. Stretching from west of Kirkman Road in Orange County on the southwest side of the city to east of State Road 434 in Seminole County to the north, with a project estimated cost of more than 2.3 billion dollars. For part of this project, Hammer & Steel recently offered the ABI TM 14/17V Mobilram to SGL Constructors (Skanska-Granite-Lane joint venture) to drive and extract 14” beams for tight conditions along the roadway. An issue the contractor had to deal with was limited availability of room. This made it difficult for a large crane with a diesel hammer to operate. In addition to increased driving efficiency, one of the many advantages of the Mobilram is its ability to work in tight spaces. Another benefit of the Mobilram is the ability to drive different types of piles. 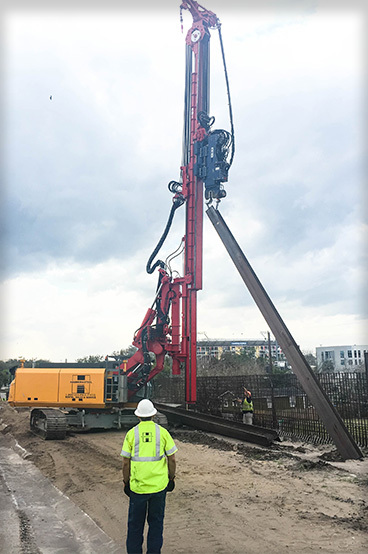 Once SGL used the ABI onsite, they were able to utilize it for additional work, such as driving steel sheet piling at various locations throughout the project. The I-4 Ultimate is one of the more significant infrastructure projects currently underway in the central Florida Corridor. Of the bridges along the corridor, there will be 13 widened, 74 replaced and 53 added, totaling 140 permanent bridges. There will also be two temporary bridges to maintain traffic during construction phasing. In addition, 15 major interchanges will undergo complete reconstruction. New Express Lanes with dynamic toll pricing will be added to the center of I-4, two in each direction, and the general use and auxiliary lanes will be rebuilt. The posted speed will be increased from 50 to 55 mph. We at Hammer & Steel are proud to help provide the equipment for this extremely important project. Learn more about the ABI Mobilram.